The University of Houston Special Collections is proud to announce the acquisition of the Tenneco Energy History Records as a part of our Energy & Sustainability collections. In Macon County, Tennessee, shortly after the discovery of natural gas in 1933, Wade Thompson founded Tenneco Gas. 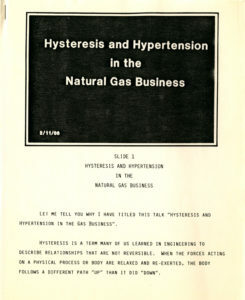 In 1943 Henry Gardiner Symonds became the first president of the newly established Tennessee Gas Transmission Company in Houston. The company would be rebranded as Tenneco in 1966, diversifying its business interests and acquiring assets from other industries, targeting failing companies for rehabilitation and profit. 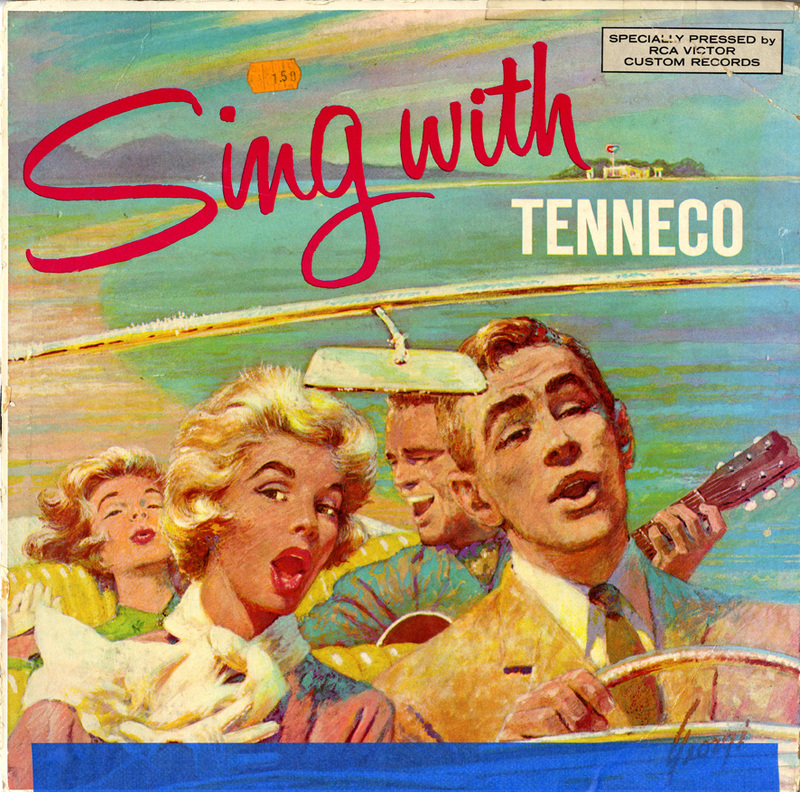 Eventually, Tenneco’s holdings included manufacturing, construction, agriculture, shipbuilding, automotive, a chemical company, and, yes, the transmission of natural gas. As the price of oil dropped and the energy economy contracted in the 1980s, financial strains prompted Tenneco to break up the Tenneco Oil Exploration Company and sell off oil and gas assets to multiple suitors including Chevron, Amoco, Mobil, and Conoco in 1988. In the 1990s, Tenneco further reorganized around their automotive and packaging business, selling off their other diffused businesses. Now, thanks to the generosity of Gary Cheatham, the contributions of Joe B. Foster, and the efforts of many others, the Tenneco Energy History Records are available for research at the University of Houston, in the heart of the nation’s Energy Capital. 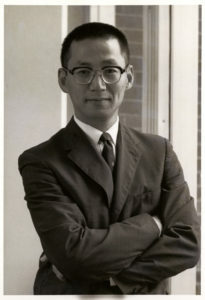 Foster held a number of positions with Tenneco following his graduation from Texas A&M University in 1957. He was named Chief of Planning and Economic Analysis for Tenneco Oil Exploration and Production in 1968, assumed the role of president of Tenneco Oil in 1978, and retired after 31 years of service to Tenneco as the company altered their strategic direction in 1988. 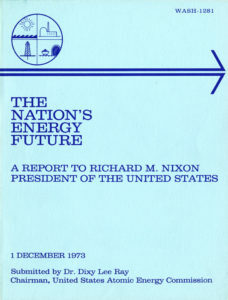 Included in the records are Foster’s notes, speeches, and research over the years, providing some fascinating insight into the energy industry that goes well beyond a simple “boom” or “bust” understanding of decades of tumult in the energy industry. Materials date back to policy documents from the 1970s, exploration reports in the 1980s, and plans related to the reorganization and sell-offs of Tenneco’s various assets in the late 1980s and 1990s. The Tenneco Energy History Records serve as a critical piece of our larger Energy & Sustainability collections. Thanks to the assistance of Dr. Joseph Allen Pratt, UH Special Collections has pooled a number of archives, books, and journals that document the history of energy production and its relation to the environment. 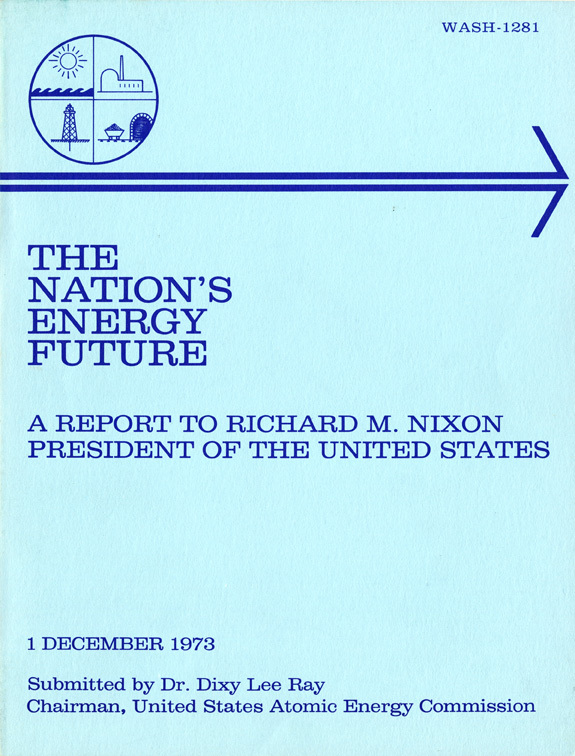 We encourage researchers to visit our reading room to sample the Tenneco Energy History Records as well as other resources like our Joseph S. Cullinan Papers, the Terry Tarlton Hershey Papers, or the H. David Kaplan Schlumberger Well Services Collection. 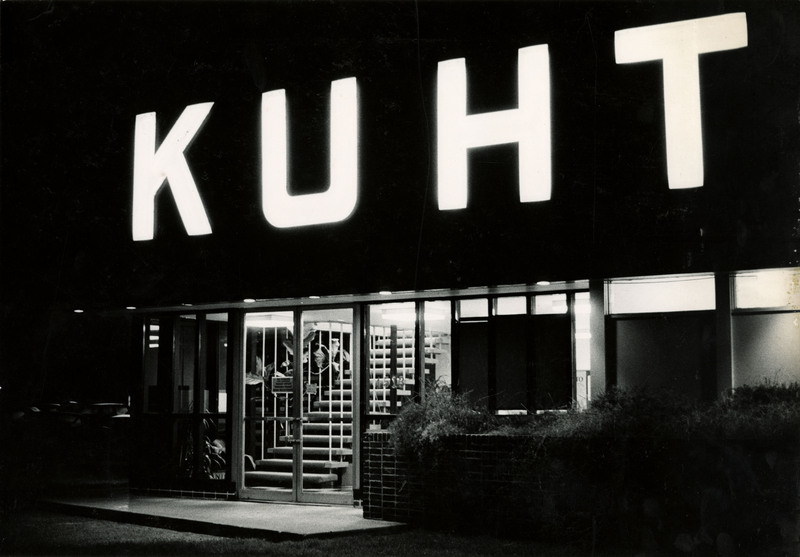 When I arrived at the University of Houston Special Collections a year and a half ago as the first dedicated Audiovisual Archivist in the department, I was delighted to discover that UH was home to the KUHT Collection. I personally have a long-time love of public broadcasting, and KUHT holds the notable, and perhaps surprising, title of the “first educational non-profit television” in the country. Educational television was championed in the 1950s as a way to turn every living room into a classroom and would eventually evolve into what we know today as the Public Broadcasting Service (PBS). One of my first tasks was to gain better intellectual control of the collection in order to help set preservation priorities and ensure access to researchers. 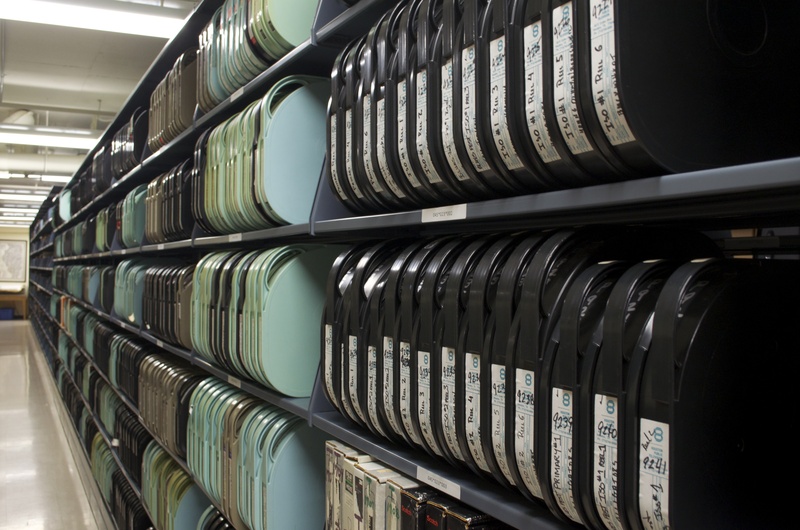 Under the guidance of Special Collections Program Manager Matt Richardson, several dedicated and hardworking student workers shifted over 2,000 films and 10,000 videos out of boxes and to new dedicated AV shelving. This new shelving meant that videos could be stored standing up on edge, rather than stacked in boxes, which put the fragile tapes at risk of damage. 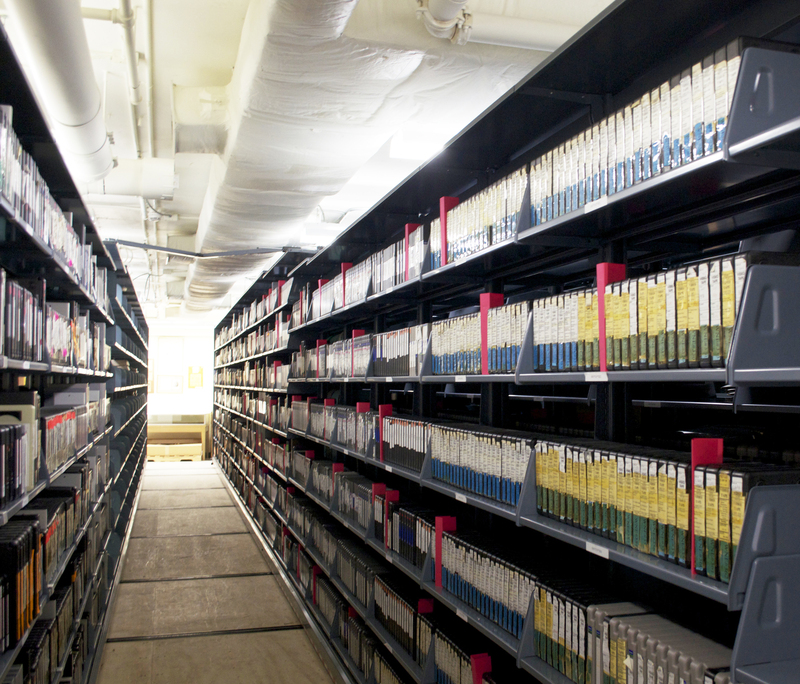 The improved storage method also allowed for easier access to tapes for inventory purposes. Working on and off on the inventory over the past year, I am now nearing completion, with just a handful of shelves left to go. 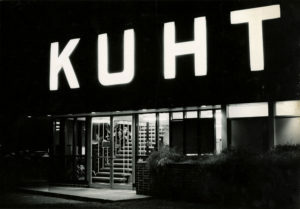 Over the year, I have learned a lot about the programming of KUHT over their sixty-three-year history. I’ve come across such curious titles as “Heartbreak Turtle” and “Teenager: A Disease of What?” as well as moments of historical significance captured on film, such as an early 1960s interview with Houston civil rights leader Rev. William A. Lawson. One of my personal favorites from the collection is the series, “People are Taught to Be Different,” available to view on the UH Digital Library. This series, a 1956 collaboration between KUHT and Dr. Henry Allen Bullock from TSU, utilizes interpretive dance and narration to describe the universality of emotion across race, nationality, and culture. 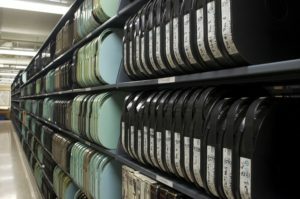 In an effort to make these materials more readily accessible to the public, the KUHT Collection finding aid has been updated to note the extent of the audiovisual holdings, and now includes an abridged list of collection titles, with an eventual eye at making the entire inventory available online. Furthermore, we have digitized and posted one pre-existing Rolodex-style catalog of 1″ Video for researchers to use. Our hope is that this resource will be a valuable asset to those with an interest in the history of public television, Houston, and the many other topics touched upon in six decades of non-profit television productions. 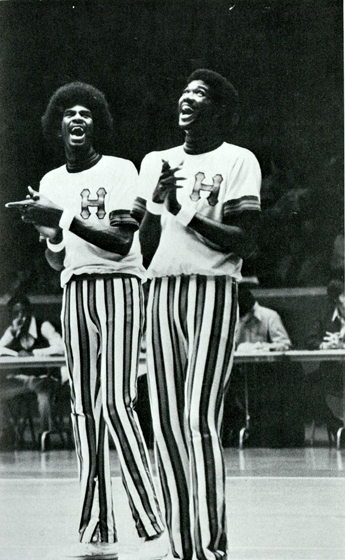 Last week we lost a Houston basketball icon in Dwight Elmo Jones, who passed away on July 25, 2016 after battling a heart ailment over a number of years. 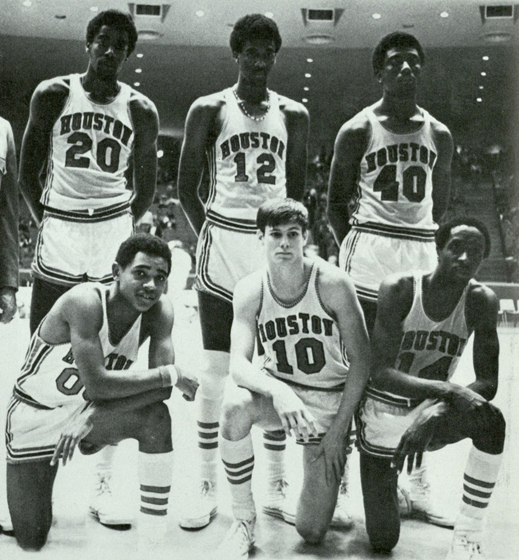 Before Clyde Drexler dunked his way to H-Town fame at Sterling High School, helped establish Texas’ Tallest Fraternity, and claimed an NBA title with his hometown Houston Rockets, Dwight Jones had already established himself as arguably the greatest high school basketball player in Houston history. 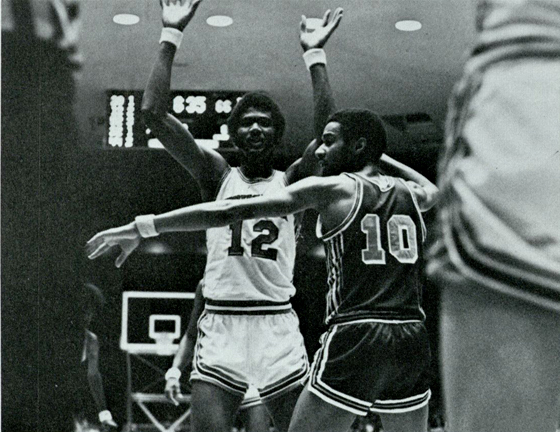 Born in 1952 in Houston, Jones led Wheatley High School to three straight state championships from 1968 to 1970, played for the Cougars from 1971 to 1973, and even contributed to the Houston Rockets, from 1976 to 1979. Coaches and teammates of Jones remember him being a special talent from a young age. Playing as a man among boys, playground lore suggests he was already dunking a basketball in the seventh grade. In high school, his Wheatley Wildcats racked up a remarkable 102-2 record and as a senior he averaged 28 points and 24 rebounds a game for the Wildcats in the newly desegregated University Interscholastic League. Recruited by the legendary Guy V. Lewis, Jones played on two NCAA Tournament teams for the Cougars while also leading the 1972 USA Olympic team in scoring before being ejected in the infamous gold medal game, as the Americans fell to the Soviets. 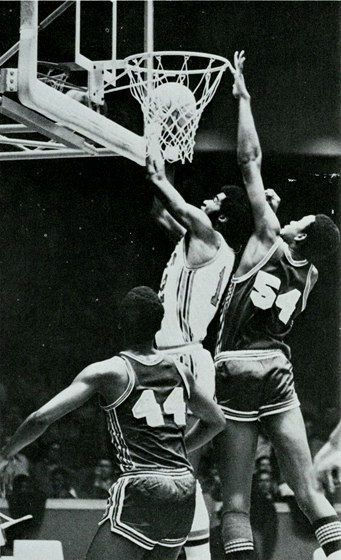 Jones was drafted by the Atlanta Hawks in 1973 before joining the Rockets in 1976. His career in the NBA would run through the early 1980s and include stops with the Chicago Bulls and the Los Angeles Lakers. A fierce competitor, his resolve was no doubt tested when he heard himself declared dead prematurely in an emergency room in 2012. Yet, to everyone’s surprise (except perhaps those closest to him), he survived the surgery and battled his illness with a fervent spirit for nearly four more years. 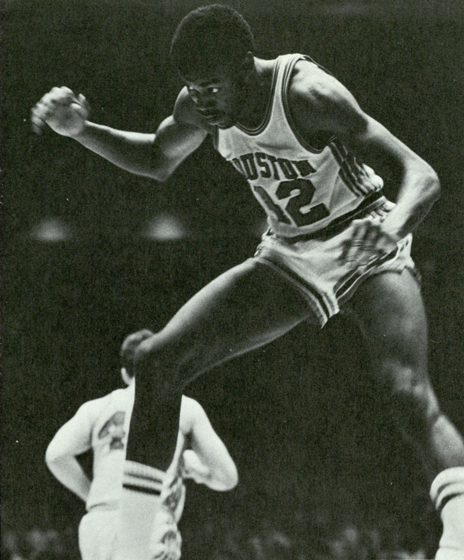 In remembering Jones, current University of Houston Head Coach Kelvin Sampson said, “Dwight was a tremendous competitor, who represented the University of Houston and his nation well during his playing career. While his health declined in recent years, he faced those challenges with the same courage and spirit that made him one of our program’s greats. Tonight, our hearts go out to Dwight’s family and friends and all those who knew and loved him.” The Jones family has established a gofundme page to help defray the expenses they now face. Canopy at PGH covers stairs to abandoned underground office suite. Photo by author. Stairs at PGH lead to now abandoned underground office suite. Photo by author. Have you noticed the stairs to nowhere? Hiding in plain sight, in the center of the University of Houston campus, next to Philip G. Hoffman Hall, a concrete canopy protects the entrance to what looks like a Cold War bomb shelter. Now abandoned and gathering debris, this is a relic of the university’s soured love affair with underground buildings. 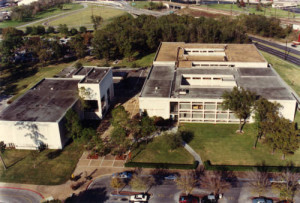 In the 1960s, the campus assumed a more suburban look; new buildings were widely-spaced, separated by expansive lawns and groves of trees. To preserve this park-like setting, university planners tried to hide new buildings beneath lawns or plazas. It was all very logical: A plot of land did double-duty, allowing the university to capture usable space for activities without losing precious open space outdoors. During this period four buildings and parts of others were placed underground, but by 1980 this fad had run its course. What happened? Public tastes changed as Modern architecture, which brought us the underground buildings, lost favor to more traditional styles. More importantly, university planners recognized the dangers of flooding in low-lying Houston. Flooded streets have always been a nuisance, but flooding from Tropical Storm Allison in 2001 was unprecedented and caused millions of dollars in damage to campus buildings. Today the university does not put buildings underground, and new buildings do not have basements. Buried a few yards north of the Ezekiel Cullen building is a facility that began life in the 1960s as the University Computing Center. When the university moved its mainframe computers to a new building on Elgin Street in 1976, this area became an office annex for E. Cullen. Allison filled it with water. Rather than repair the damage, the university locked the doors and abandoned it. 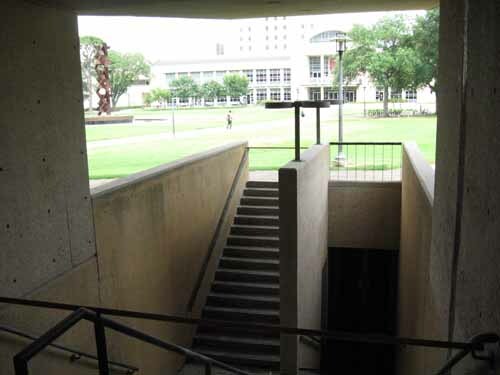 In the mid-1960s the university spent a lot of money to dig a huge hole next to the University Center for an underground annex topped by a plaza. Fifty years later, as part of the UC renovations, the university spent a lot of money to fill in the hole and build the replacement structure on top of it. It has no basement level. 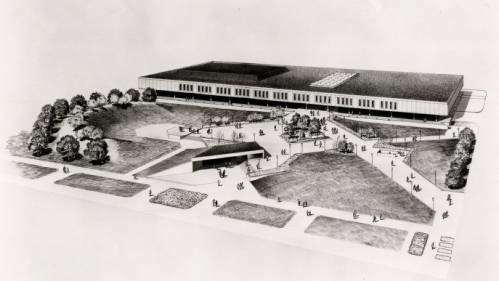 Architectural rendering of University Center with underground annex in foreground, mid 1960s. Photo courtesy of UH Buildings Collection, Digital Library. From the south, Agnes Arnold Hall, a mid-rise tower, appears to rise from a large open courtyard located below street level. The building is reached by a bridge, which spans the courtyard below. In Allison the courtyard, a basement-level lecture hall, as well as elevators and escalators, were all flooded. UH Law Center. Large plaza in background covers underground library. Central courtyards in classroom buildings on right also cover underground libraries. 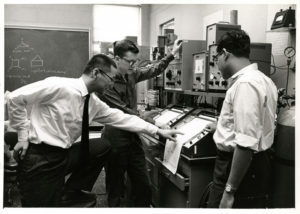 Photo courtesy UH Buildings Collection, Digital Library. The UH Law Center opened in the early 1970s with a group of two-story classroom buildings clustered around a large plaza. Beneath the plaza was the law library. Each of the classroom buildings had an atrium-courtyard; below it was a satellite library in the basement. In Allison the entire lower level flooded, causing catastrophic damage to the library collections. As the campus expanded to the northwest, university planners grouped the new science and fine arts buildings around a grassy quadrangle. Beneath this lawn was the new University Center Satellite, which provided dining and recreational facilities for students on this end of the campus. This building was inundated in Allison and remained closed for repairs for more than a year. 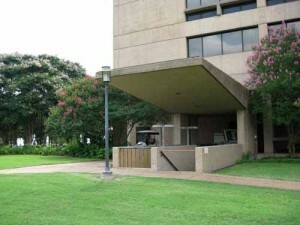 When the University Hilton and the adjoining School of Hotel and Restaurant Management were built in the 1970s, the complex included a parking garage. The garage is under the building, reached by a steep ramp from the street. Like all of the other underground structures, it flooded in Allison. 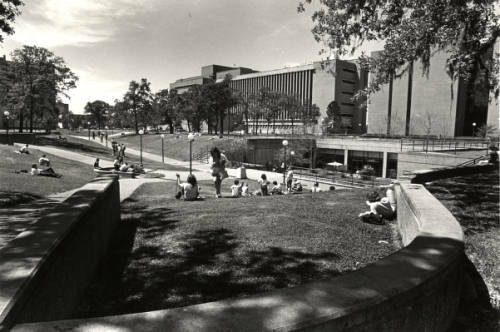 Students lounge outside UC Satellite, circa 1980. Sloped lawn directs water toward entrance. Photo courtesy UH Buildings Collection, Digital Library.